The origins are uncertain. 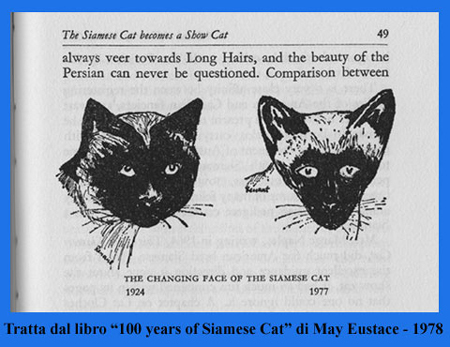 However we know that Siamese cat was already appreciated from 1330, like a pet at the Royal Court of Siam (now known as Thailandia), so the “Siamese” name. Between the ruins of Aythia, the capital of this reign, it has been found a book of the age named “Poems of the cat”, in which these cats from the splendid coat have been represented beside the royal family of the time. It seems in fact that these cats were so considered from reigning, that was forbidden to export them without their authorization. They are sacred cats, breeded by clergymen like guardians of the temples. In Europe these cats arrived only at the end of the 1800, and after the first difficulties of adaptation to the climate , they began to fascinate people and to diffuse themselves. This breed was recognized in Europe around to years ’20. It seems the founders of lineage of the breed have been donated to England from reigning of the Siam, they were two splendid exemplary, Pho and Mia. In the Sixties , the renewal touch took also this breed , that were modified and extremized: so the New Siamese born and it carried away the place and the name to the “old” Siamese. This cat not only lost the place in the feline expositions, but also in the heart of the breeders , so they lost their genealogy. So the Old style Siamese becomes unavailable and now is in danger of extinction . In the ’90 finally some breeders have started again to breed this cats , to avoid the definitively lost of this breed ; so in the 1998 some exemplars have been recognized as “pedigreeded cats”. 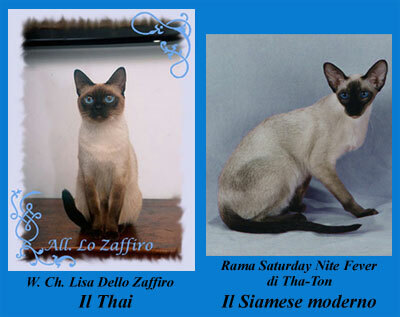 They are now the founder of lineage of the breed , but they could not be called as “Siamese”, so they was called THAI, like Thailand , the ancient Siam .